I spent the weekend rigging extension cords, timers and power strips through the rafters in my attic so that I could get my indoor growing operation set up. And no, this was not your typical ambitious Humboldt County indoor grow. No blowers, no tanks, no generators. Just enough equipment to get some flowers going ahead of springtime. But I still found myself wondering: Do I really need all this equipment to sprout a few seeds? And if so, what can I learn from the more experienced indoor growers in my community? The answers to those questions are: yes, and plenty. Those of you with sparkling glass conservatories filled with sunlight and natural, radiant warmth are free to turn the page and enjoy the rest of the Journal at your leisure. But those of us who live in dark, drafty houses and still want to get some seeds going will need some gear and some know-how. First, pick a spot in your house that has access to safe, reliable electrical outlets. I live in an old house with questionable wiring, but the attic was rewired a few years ago and probably has more safe, grounded, functional outlets than the rest of the house put together. And my electrical needs are modest: I have three sets of ordinary shop lights outfitted with fluorescent tubes and two seedling heat mats to plug in. That's probably all you'll need, too. It's also helpful to pick a location that isn't too far out of the way. I chose the attic because I work up here and I can check on the seedlings 20 times a day. (Hey, it beats wasting time on Facebook.) If you can situate it near a window, great, but I guarantee that natural light from a single window won't do it. You're going to need some grow lights. Ordinary shop lights are available at any hardware store for less than $20. I have three of them for a seed table that is about the size of a kitchen table. They take two fluorescent tubes each; while you can buy more expensive full-spectrum, natural light tubes, I've always used the ordinary tubes that sell for a couple dollars each. The usual advice is to put one warm and one cool tube in each fixture, and that works fine for me. You're going to need to rig them up with chains so you can adjust the height, and you'll need a timer. So go check that out if you like a lot of toys and gear. But either way, there's one more piece of equipment you're going to need: a seedling heating mat. Most seeds simply won't germinate unless soil temperatures are between 70 and 85 degrees. That just does not happen at my house, and I'm guessing it doesn't happen at yours. So really, invest in these mats, which you can pick up at either a local garden center or a hydro shop. They last for years, and they're really tough and waterproof. Now, here's what the indoor growing experts I spoke to this weekend told me: The biggest mistake most people make is not providing enough light to their indoor plants. So get those lights right down on your seed trays. I'm talking about hanging them one or two inches above the plants. Seriously. If you don't give them enough light, you'll end up with thin, leggy seedlings that simply won't thrive. Hang them on chains in such a way that they are easy to adjust as the plants grow. If you have three sets of lights like I do, you can eventually have two sets above your seed flats, and one set adjusted to a different height to accommodate whatever plants are starting to get tall. And -- this is where the timer comes in -- they'll need 14-16 hours of light per day. When you do get your seeds started, be sure to use an actual seed starting mix rather than potting soil or ordinary garden soil. It's lightweight and it holds moisture evenly, which is important while seeds are germinating. Once seedlings have emerged and survived their first week or so, they're going to need regular feedings of a liquid organic fertilizer, too. One last thing. Plant seeds at the right depth -- tiny seeds practically sit on the surface, while big hefty bean seeds need to be buried roughly as deep as the seed is tall -- and thin them ruthlessly once seedlings emerge. Really. Get tough. Cull the herd. 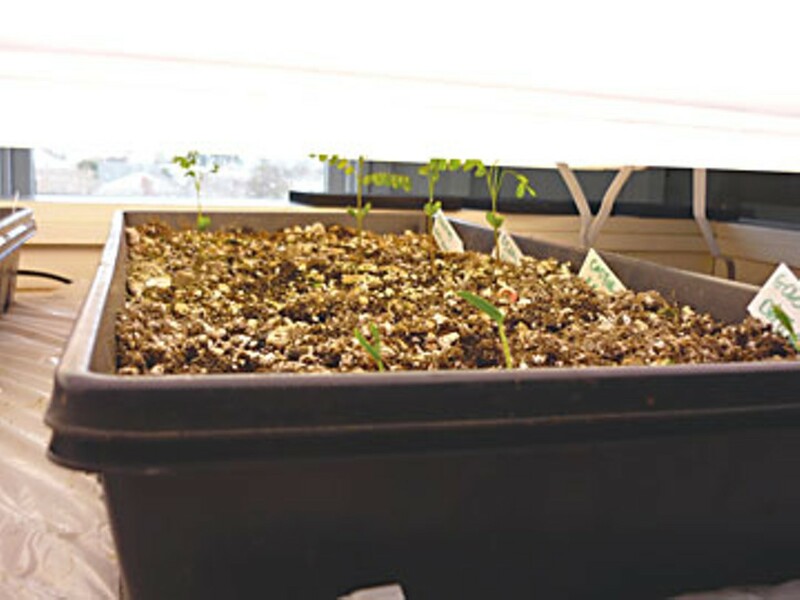 Before long the largest seedlings will need to be transplanted to larger pots, and after that you'll be taking young plants outside to harden them off and get them ready for life in the great outdoors. But for now, get your gear set up properly. Once you've made this initial investment, I promise that the rest of the journey will be ridiculously cheap and endlessly satisfying and entertaining. 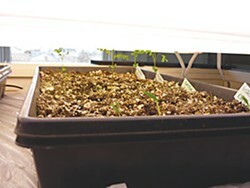 More about seed-starting in a few weeks, so stay tuned.